Oh Beachy Head Marathon, you are irresistible. The four I have completed can virtually sum up my running career. Year One, 2014. I wanted to run under 4 hours. But I was filming as well. I started too fast, was completely done in by 17 miles and walked most of the last 6. It’s fair to say that I was well and truly beaten up by my first encounter with the Beachy Head Marathon. Year Two, I was fitter, more confident, but wary of the same thing happening again. So I set myself the modest target of beating the previous year’s time and ideally coming in around 4:30. I ran well and, if I had only realised during the race how well I was running, I may have beaten the 4 hour mark. As it was, I crossed the line in 4 hours and one minute. But in the grand scheme of things I was well pleased. I had vanquished the demons, laid the ghost to rest and finished the unfinished business. Year Three I was definitely not fit. I had been injured in The Gauntlet half iron distance triathlon a few weeks before and had done virtually no training for a month. 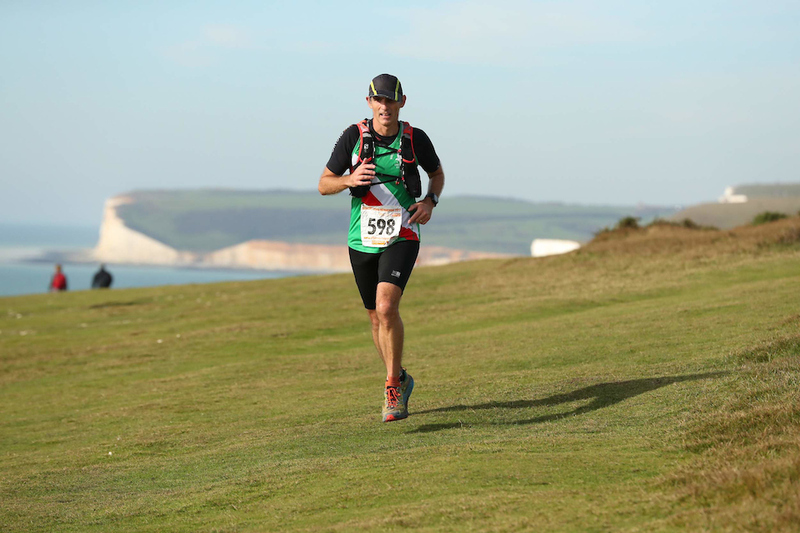 I came into the 2016 Beachy Head Marathon hoping to just get round. I started conservatively and felt comfortable for the whole run, but my time was a very average 4:28. I was pleased given the complete lack of training. Indeed my lack of fitness was exposed a week later at the flat Thames Meander Marathon when I crashed and burned half way round and finished in 5 hours. So came Year Four. The Beachy Head Marathon 2017. For a start, the weather was absolutely perfect. Glorious sunshine but not hot. Perfect running weather. A few whispers suggested it would be very cold on the top of the hills and that we should wear a jacket. Sod that, I thought. The weather forecast I saw said it would be bright sunshine all day and mild temperatures. I would be wearing my hydration vest so, as far as I was concerned, that could count as another layer! This year I am fit. 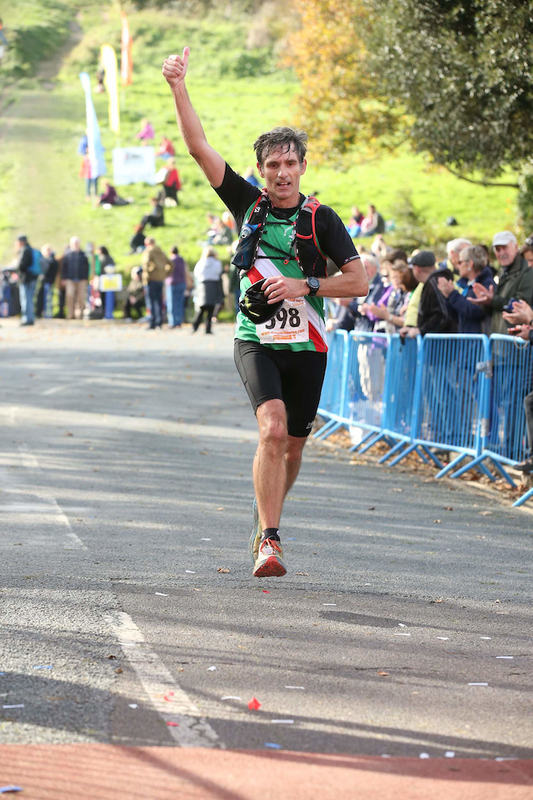 I have been running and racing consistently since the beginning of July following my injury and DNF at the South Downs Way 100 in June. I’ve been putting in at least 1000 metres elevation each week and averaging 100km distance. This is definitely a step up from previous years. In the past, when I have tried to up my weekly mileage I have felt shin splints starting to develop. But the change has been running far more on trails than road, which I think has reduced the impact and enabled me to go from 40 miles a week to a regular 60 miles a week. 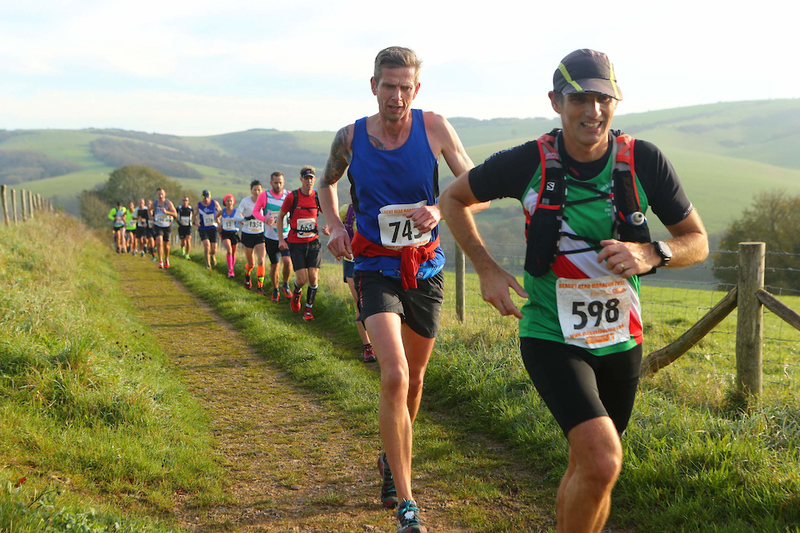 Beachy Head Marathon 2017 was to be the first real test of this new level of training. As you may know, I film an awful lot of my races and this does prevent me from going all out. I didn’t film the recent Downslink Ultra but I trained right through without any taper and ran it as part of my training week. As a result, my time was not a good indicator of where I am in my training. So for Beachy Head, I was interested and excited to see if I could finally beat the elusive 4 hour mark. I was confident but you just never know what the Seven Sisters are going to throw at you. 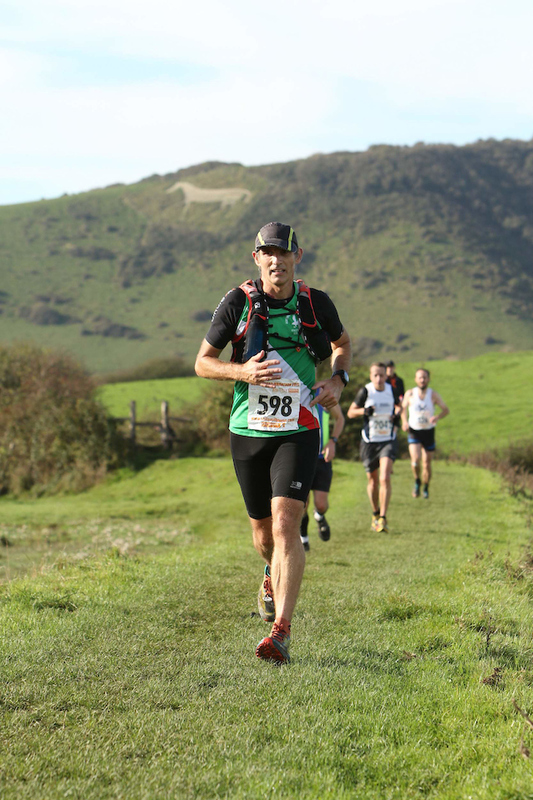 For those that don’t know anything about the Beachy Head Marathon, it’s worth reading this report from 2016 where I go into a bit of detail about the history of the race. Suffice to say that the Beachy Head Marathon is as old as the London Marathon and was formerly known as the Seven Sisters Marathon. It starts in Eastbourne where the South Downs Way footpath heads up from Beachy Head Road. From there the route heads inland to follow the South Downs Way bridleway to Jevington and Alfriston. It then heads back to the coast via Littlington and West Dean. The final six miles takes you back to Eastbourne over the Seven Sisters cliffs past Belle Tout and Beachy Head lighthouses. It’s a superb route with stunning views and challenging terrain. I picked up a few club mates, including Richard, early on Saturday morning and we arrived in very good time to park, get in the toilet queue before the lines got too long, collect race numbers and leave bags in the gym at St. Bede School. In a change from recent years, a side door had been opened allowing much easier access to the left baggage area. Why they haven’t done this before I’ve no idea. My friend Paul Coates took his camera along and got me on film before we headed up to the start line. There was a good turn out of Worthing Harriers as there often is. 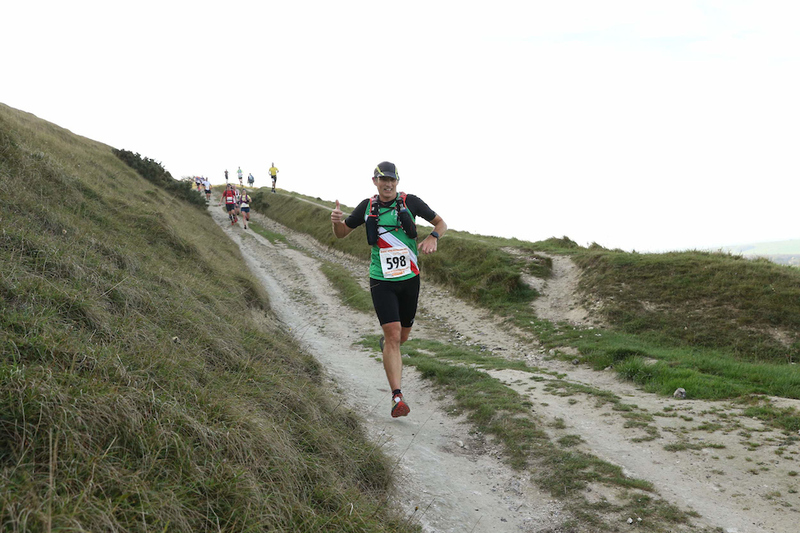 The Beachy Head Marathon is a bit of an annual must do these days. Ben was attempting his first trail marathon. Tom was back for a third crack having achieved 3:55 last year. Phil, Debs, Simon, Jen and Darren all joined the party. Start time was 9am and at the gun, Richard, Tom and Ben went off and were out of sight before I had even reached the hill that looms up from the start. I am experienced enough these days to know that I have to run my own race. I made my way conservatively up the hill and gradually started to get myself together. I ran much of the first few miles within shouting distance of Cat Simpson and Sarah Sawyer, who were both running well. Look them up, both very good runners. I have never run the Beachy Head Marathon in really bad weather, but today was undoubtedly better than the previous three. It was a perfect mix of blue skies, sunshine and cool temperatures. I didn’t even notice the wind really, until I had to turn my cap around at one point so it didn’t blow off. As the kilometres ticked by I knew I felt strong and because I had started relatively slowly, I was gradually passing runners ahead of me from quite early in the race. Usually, I say to myself that I don’t mind runners coming past me in the first third, but by halfway I need to start to pick them off. If I’m having a good day, that’s how it will work out. If I’m having a bad day, I’ll start to see runners coming by me and disappearing off into the distance during the second half of the run. Coming into Alfriston I was chatting with Tom and another chap and I was saying how I was o course for a 3:50 finish. “No, you’re on for 3:30 at the moment,” said this chap. Turns out I had done my maths wrong! If you’re a runner you’ll know that quite a lot of the time, in a long race, you are working out split times in your head. ‘If I can keep this pace for the next 10 miles then I’ll get to such and such point in such and such time’, etc, etc. Maths has never been a strong point! My plan had always been to get to halfway at between 1:50 and 1:55. As it was I ran through 21km in 1:47. But I felt good so I wasn’t worried. (That is often the kiss of death though and a dangerous strategy. Running quickly early on because you feel good will often lead to disaster in the latter stages of your race, but I digress). There is a very good section of relatively flat, fast running for a few miles at the halfway mark. So I pushed on. I knew Tom was trying to stay with me so I thought I would see what he was made of! Coming into the aid station at Littlington I decided to have a break. I didn’t stop but I walked up the hill out of the village and had a good amount to drink and some chocolate. I didn’t stop at any of the main aid stations at all in fact. I had water in one soft flask and Red Bull in the other. I also had a Mars bar, of which I took two bites throughout the race. This is what comes of being fairly well fat-adapted. I do a lot of long training runs on nothing but water, so I am well used to running on empty. I think my body can efficiently use fat as fuel these days and as a result, I need minimal carbohydrates to keep me going. Of course, that’s all very easy to say when things are going well. I thought I had pulled away from Tom, but climbing the steps through Friston Forest at around 18 miles, I heard a familiar voice behind me. He’s a strong runner and a fast runner, but he’s not done as much training as I have of late, so he’d have to dig in to stay with me over the Seven Sisters. One of the best parts of the Beachy Head Marathon is getting to the top of the second flight of stairs in the forest and coming out to the stunning view over the Cuckmere Valley and Exceat. It’s an exhilarating run down the hill and across the road to the cheers of the many spectators who gather at that spot. You know, at this point, there’s one big push now over the Sisters back to Eastbourne. There’s a big climb out of Exceat and I always think, if you can run up that hill then you’re doing well. Those who are starting to struggle will not have the mental or physical strength to run it and will take it as a time to rest. But it’s at this point where you really need to dig in and step it up. From the 19 mile point it’s just up down, up down for 7 miles. The Seven Sisters themselves are not massive climbs, but one after another they grind you down and if you are tired to start with, they will chew you up and spit you out. I’d like to say I ran up every one, but I’d be lying. I ran up the first few metres and then took to power hiking the rest. There’s a ‘water only’ stop at the top of one of the Sisters and I filled my bottle, which was the only time I stopped at an aid station. I ran straight through Birling Gap, which is where I nearly pulled out in 2014. By now I had finally lost Tom! I didn’t look back though, and ran the flat section round the bottom of Belle Tout lighthouse before the final two climbs up to Beachy Head itself. By now I was pretty tired. I did have to walk most of the penultimate climb but managed to run the final climb up to the Beachy Head pub. From here it’s a mile of fast downhill running to the finish and the finish arrives quicker than you expect. You round a corner and suddenly you can see it down below. It’s a real sprint down the hill, being careful not to trip on the steps or the falter on the steep descent. I would have been happy to get in under four hours. My goal was to try and finish in about 3:50. Towards the end I wondered if I might possibly make it in 3:45 because I felt good and was running well. I crossed the line in 3:38:57. I couldn’t possibly have dreamed of that time. Of course, I still didn’t beat my running buddy, Richard, who finished in 35th place in 3:31. I think we have both stepped it up a bit this year. Certainly, we have climbed far more elevation this year than in previous years and I am definitely doing more mileage. But 47th place in 3:38 was far better than I had expected and I am absolutely delighted. There are not many marathons where you get to go swimming in a pool immediately afterwards. There are plenty where I’ve jumped in a lake or the sea, but at the Beachy Head Marathon you have use of the St.Bede School pool. It’s not really advertised so not many people know about it. But you do now so you’re in the know for next year. There’s also a free meal in the school cafeteria for all runners, but I don’t often partake as I usually can’t eat immediately after running. What I can do is drink copious amounts of coffee and Coke!! I met Richard in the Pilot pub at the end of Meads Street as I think we have done the past three years, before heading back to Worthing. 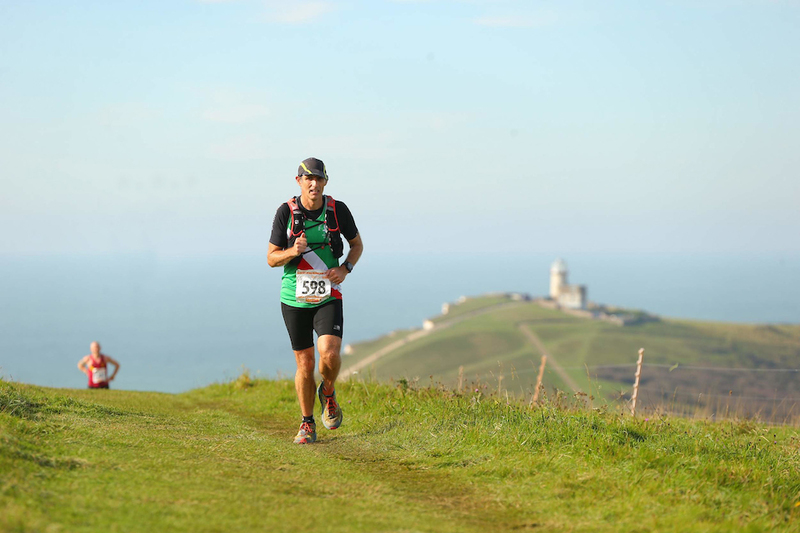 The Beachy Head Marathon is right up there with my favourite races. It is an absolute MUST DO race, certainly in the south of England if not the whole UK. I just wish they would get a UKA licence for the event so it shows up on Run Britain Rankings and Power of 10. AND, perhaps, they could just add that missing half a mile to make it the full and proper 26.2. But I’m nitpicking to be honest. In trail running most people aren’t so bothered about exact distances. It’s just we’d probably prefer it to be longer than 26.2 miles rather than shorter! If you’ve watched Paul Coates video, you might also want to watch Paul Coe’s film. Watch to the end where both Pauls gang up and have a good old dig at me!! Bloody cheek.